After five years of writing, rewriting, reviewing, proofing, preparing, and printing, the North American Ministerial Council of the General Conference of the Church of God (Seventh Day), with editorial and production expertise from Bible Advocate Press, presents a full-length book on doctrines for your use. This handy guide develops and defends each of the twelve points in the Church’s Statement of Faith, using the Scripture as its only authority. It has been said that in addition to a Bible and a good hymnbook, all Christians should own a book that explains the main teachings of Scripture and of the church to which they belong. 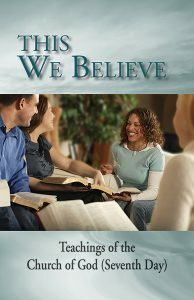 This We Believe is just such a book for CoG7. Order your copy from our online bookstore (select either English or Spanish). Después de cinco años de escribir, re-escribir, revisar, preparar e imprimir, el Concilio Ministerial de Norteamérica de la Conferencia General de la Iglesia de Dios (Séptimo Día), con la experiencia editorial y de producción de la Impresora del Abogado de la Biblia, presenta un libro completo sobre nuestras doctrinas, que podrá utilizar. Esta práctica guía desarrolla y defiende cada uno de los doce puntos en la Declaración de Fe de la Iglesia, usando las Escrituras como su única autoridad. Se ha dicho que además de una Biblia y un buen himnario, todos los cristianos deberían tener un libro que explique las principales enseñanzas de las Escrituras y de la iglesia a la que pertenecen. 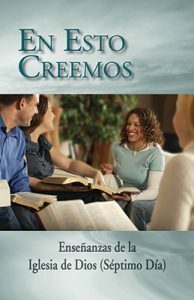 En Esto Creemos es ese libro para la Iglesia de Dios 7. Ordene su copia en nuestra libreria en línea (seleccione español o inglés). The Bible Adventure is a book-by-book introduction to the Holy Scriptures. Instead of a uniform template for each book, Calvin Burrell uses a freestyle approach to identify the most meaningful and memorable elements of each. These summaries were first written and published as a series in the Bible Advocate magazine. This book can be used for devotional reading or as a resource addressing the essence of the Bible’s 66 books. It can be helpful to those who like to analyze and summarize Scripture, or to those who need a handy reference to important ideas and texts in the various books. 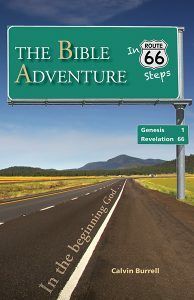 Do yourself, your family, and your friends a favor by taking a journey with them down the Bible’s Route 66! Click here to order from our online bookstore: The Bible Adventure. 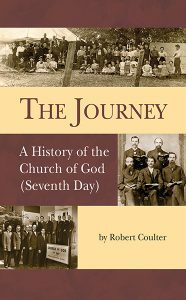 The Journey: A History of the Church of God (Seventh Day) is a fully documented resource for studying the Church’s historical and theological development. Its factual reports, many of which are less than fully positive, are confirmed by the Church’s Colorado archives, particularly by a near-complete library of the Bible Advocate magazine and its forerunner, The Hope of Israel – since 1863. Click here to order from our online bookstore: The Journey: A History of the Church of God (Seventh Day).